Post: Gaurav Akrani. Date: 6/04/2011. Comments (15). Label: Management. Management is a challenging job. It requires certain skills to accomplish such a challenge. Thus, essential skills which every manager needs for doing a better management are called as Managerial Skills. According to Prof. Robert Katz, all managers require above three managerial skills. However, the degree (amount) of these skills required varies (changes) from levels of management and from an organisation to organisation. The above picture or diagram shows the managerial skills which are required by managers working at different levels of management. 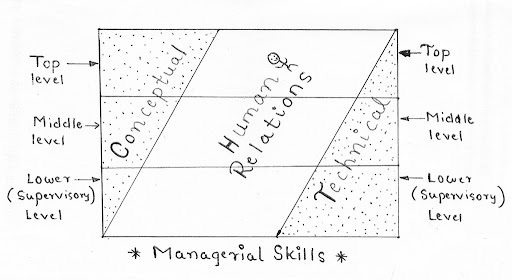 The top-level managers require more conceptual skills and less technical skills. The lower-level managers require more technical skills and fewer conceptual skills. Human relations skills are required equally by all three levels of management. Conceptual skill is the ability to visualise (see) the organisation as a whole. It includes Analytical, Creative and Initiative skills. It helps the manager to identify the causes of the problems and not the symptoms. It helps him to solve the problems for the benefit of the entire organisation. It helps the manager to fix goals for the whole organisation and to plan for every situation. According to Prof. Robert Katz, conceptual skills are mostly required by the top-level management because they spend more time in planning, organising and problem solving. Human relations skills are also called Interpersonal skills. It is an ability to work with people. It helps the managers to understand, communicate and work with others. It also helps the managers to lead, motivate and develop team spirit. Human relations skills are required by all managers at all levels of management. This is so, since all managers have to interact and work with people. A technical skill is the ability to perform the given job. Technical skills help the managers to use different machines and tools. It also helps them to use various procedures and techniques. The low-level managers require more technical skills. This is because they are incharge of the actual operations. Apart from Prof. Robert Katz's three managerial skills, a manager also needs (requires) following additional managerial skills. Communication skills are required equally at all three levels of management. A manager must be able to communicate the plans and policies to the workers. Similarly, he must listen and solve the problems of the workers. He must encourage a free-flow of communication in the organisation. Administrative skills are required at the top-level management. The top-level managers should know how to make plans and policies. They should also know how to get the work done. They should be able to co-ordinate different activities of the organisation. They should also be able to control the full organisation. Leadership skill is the ability to influence human behaviour. A manager requires leadership skills to motivate the workers. These skills help the Manager to get the work done through the workers. Problem solving skills are also called as Design skills. A manager should know how to identify a problem. He should also possess an ability to find a best solution for solving any specific problem. This requires intelligence, experience and up-to-date knowledge of the latest developments. Decision-making skills are required at all levels of management. However, it is required more at the top-level of management. A manager must be able to take quick and correct decisions. He must also be able to implement his decision wisely. The success or failure of a manager depends upon the correctness of his decisions. Thank you for sharing the Manegerial Skills. It is very useful for my management course.I found that I understand better on those three. Thank you for providing this information I got help in my self study this gave me better reference towards managerial skills. Thank you for this wonderful and more detailed break-down of the managerial skills explanations.It is reader friendly(easy understanding)and has helped me much in my management course assignment. Thanks u for more lighting on those skill now I can understand better... Wishing u more power to ur elbow. this is awesome..am very thankful you people. it has helped me do my assignment very easily. Thanks a lot for the insightful information. I have applied the info and have gained confidence. Thanks so much for the information, i now have a better understanding of the managerial skills and the other required by managers, have adopted them and will implement them in my management career. Excellent information, it has helped me in my assignment. Thanks. Thank you for the knowledge... The materials are really helpful.. summarized and can easily be understood..